In memory and honor of one very special cat.. how QUACK Edward J. Nichols, DVM, Crestway Animal Clinic, San Antonio, Texas, treated Suki. Lawsuit filed against me on July 21, 2005, by Ed Nichols with temporary injunction in an attempt to dismantle this web site and enjoin me from telling how Suki was treated. Ed Nichols and Crestway Animal Clinic injunction denied. Ed Nichols and Crestway Animal Clinic appeal denied. Litigation continued against me by Edward J. Nichols, Crestway Animal Clinic, for 2 1/2 years. Trial scheduled for March 10, 2008. Lawsuit settled and dismissed with finality on March 10, 2008. Below are just a few of the email messages I received in the days following Suki's death on April 26, 1999. Most of them are from people I met through the Feline CRF (Chronic Renal Failure) Information Center. These fellow cat guardians were of immeasurable support and comfort to me in Suki's final days as her new veterinarians struggled to help Suki, and help me try to figure out what had happened to her. The new vets administered treatments such as IV fluids, potassium, and Epogen that Edward J. Nichols, DVM, had NOT given to Suki. Further, I have no idea why Nichols pulled Suki's tooth under anesthesia, with no IV fluids or presurgical or preanesthetic evaluation. I never authorized any such procedures, and to this day will never understand why this "doctor" did these things to my brave and beautiful cat. I can never thank the kind souls on the CRF listserv enough for helping me during the worst nightmare of my life. If you are suffering the loss of a companion animal under any circumstances, I hope you find something in these words to comfort you. -- J.C.
Dearest Julie, I know there are a few hundred of us in tears today as we read your message and the passing of your dearest Suki. You know we all pulled for you both. I know the pain you went through, the struggle, the indecision, the anger, the sense of loss, and not to forget most of all the love which will always be yours. I am so glad that you joined the list in time to get some support from those of us who really care - altho we weren't there in person, you know we were praying and loving you both from wherever we were. It was a brave battle, fought by 2 loving beings, who will be together in spirit for always. But it was not the only time that these 2 beings shared and loved each other. The Bridge will now have TWO LOUD Seniors to contend with. In your dreams tell her to watch for Princess, black and small, light jade eyes. She’ll find my angel somehow. I think they have a lot in common. Suki will never leave you, she will always be connected. I do know that Suki was absolutely glowing with white light, and the light of that love within your hearts flew her so swiftly to the stars and beyond. I have no words to express the depth of my sorrow about dear Suki. What an incredible soul she was and is. I think you were blessed to know her and have her in your life. Thanks for sending us the whole story of her last days. I truly think her strong spirit will be with you in the days ahead as you cope with the loss of her physical body. Please write if there's anything we can read from you that will lessen your pain. I think it always helps to talk, and I'm certainly anxious to read anything that you write about her or about you. Don't beat yourself up wondering if Suki knew you meant her no harm with the bad vet trips...well she did...they know when we are trying to help them...and like your [new doctor] said, they know the positive energy...they know us as well as we know them. now you won't just let anyone treat your babies...you learn as always the hard way...i sure did....but i know that Suki knew the love...you were the best mom and were picked because you were soulmates...she is still in your heart and will always be...it was an honor to have known Suki through the mails and it is a name I will always remember. I am so sorry to hear Suki has gone to the bridge. I am certain she is romping through the dried leaves and chasing birds. She was a lucky girl to have had such a wonderful mom and friend as you. I know she will be missed. Guido sends kitty kisses, kitty hugs, and purrs and we both send lots and lots of love your way. Suki was very lucky to have adopted you all those years ago. And I feel lucky to have known you and Suki during your last months together in this realm. What incredible love, devotion and spirit you both have shown! I am devastated to hear Suki is gone. Can't stop crying and hugging Boo Boo. I pray that your grief will ease, but I know it will be a long time in coming. No creature, animal or human, could have wished for a more pure, unconditional love than Suki had all her life. It's Suki's turn to watch over you now. SUKI: look for my Roo Bear on the other side of the Bridge. He's a big lug, blue and handsome. Rub noses and greet him as a friend. I like to think that that special bond between the two of you will long be remembered. I know that memory will live on in my heart. Suki was truly a remarkable kitty and I feel lucky to have "known" her. I am so very sorry for your loss. My heart is filled with sadness for you. Your decision to release Suki from her suffering was such a loving gift to her, although it broke your heart to do it. Suki's days will be full of sunshine now, and you will be re-united one day. Her spirit will never leave you, and will always be near. The hole in your heart will begin to mend as you fill it with all your wonderful memories of Suki. Please feel free to contact me whenever you just need to talk. I will keep you in my prayers. I am so sorry to hear about Suki, I shed many tears over it. Now she will be playing at the bridge waiting for you free of pain. I know you will remember all the wonderful times you and Suki had. Also that you were the best mom ever! You were both very lucky to share time together on this earth. Words cannot express how sorry we are for your loss....but you are right, we do understand. You and Suki shared a special bond. Please know that we are all here for you and will be for as long as you need us. We have never talked to each other privately, but I just heard about Suki's crossing of the rainbow bridge and wanted to extend my deepest sympathy. I am so sorry for all that happened to you and Suki during her illness. My heart aches for you. I will keep you in my thoughts and prayers. I am so sorry that sweet Suki is gone, and I am especially sorry for the way things happened. Thank you for sharing your story with us, it really meant a lot. I believe that Suki is with you now, and maybe she will come again in a dream. I think they are much smarter than we are. You were both very lucky to have each other. I'm not very good with words, but you are in my thoughts and prayers. I'm so sorry you lost Suki. I read your account of her … and just sat and cried. You two had a special relationship: you were both very lucky to have each other. God seems to put the ones with extraordinary personalities and needs with people that complement those qualities - both cat and human are better because of each other. Please know that you will be remembered in prayer and thought. Its 2am and I am wondering and hoping you are all right. It does get better. For now..drink water. If it was up to me I would have the TV stations stopping everything to ask for a moment to Remember Suki ...that is how I felt for her and for Princess...and sad that they wouldn't be . But then the world didn't win Suki's heart, you did. Oh Julie, I am so sorry Suki is gone. I am sitting here now with tears running down my cheeks, your pain is so near. I am trying to think of something to say to help you through this, but my mind is empty. Your words about Suki were so beautiful. She must have been a truly special soul. I feel like Dumplin had a human soul also. We have another cat. We love him very much also, but he doesn't have the kind of soul Dumplin and Suki had. We should consider ourselves blessed for having had them in our lives. Words can't express my deep sorrow at your loss. I felt like I knew Suki from your loving, detailed descriptions of her. She will be greatly missed even by distant friends such as me and Taffy. It's hard to imagine the great pain and emptiness you must be feeling. If I could help you in some way, I would. I am just so so sorry. It was so difficult and un-real to read of her final days. I so wanted it to be not true. Nearly 20 years is a pretty long go, but how I wish it could have been more. Dr. T was so sweet to try to keep her comfortable and to not give up hope. Dr. B sounds like a good guy, too. But it was you who knew her well enough that her weakness and her poor jaw were just too much for her to bear. Thank you for being the best ever cat-mom to Suki. Keep her safe in your heart and let that be a comfort to you. Bless you for sharing her story with us and know that it will help so many other kitties who need it. Please accept my condolences on the crossing of your beloved friend Suki over the Rainbow Bridge. I will light a candle for her, the better to brighten her journey across the Bridge to that wonderful land on the far side. My SweetPea, who I still miss dearly, will be there with all the others to greet her, and show her the best spots to nap in the warm sunshine, run and play, and of course the choicest dining places! I am so sorry to hear of Suki's passing. I cried as I read your story of your final days with her. I know how empty and cold you must feel now, just as I and so many others have felt. You are not alone! I still miss my sweet Emily so much. You are so LUCKY to have had the time with her that you did, and to know the love that you have for her -- many people never know that wonderful love. Now that she is at the Bridge, remember that her love will live with you forever. Take comfort from her love, wrap it around you, and know that you will never be alone again. You will always have Suki's love surrounding you wherever you go. I will tell Emily to introduce herself to Suki, and I know she will show Suki all the best sun-spots and flower gardens! And please email me if you need a shoulder to cry on. This week must seem like an eternity to you - so strange after all your years with Suki. After I lost Kasey I had feelings like I was living in a nightmare and that I would wake up and Kasey would be here again, or else I felt like she was just away and would be coming home soon. It was so hard to accept that she was truly gone. I kept trying to make bargains with God - just to have one more day with her. 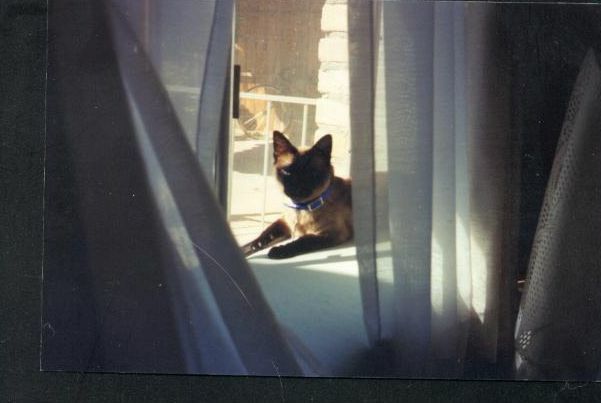 I hope you don't mind that I write these things - it is not out of arrogance or anything - just understanding of the ordeal of losing my closest companion for the last 15 years. Don't let anyone tell you that you shouldn't mourn - Suki was as important to you as anyone. She deserves to be mourned and you deserve whatever comfort you need during this period (and I think, forever). I am sitting here helplessly crying at my computer for you and for Suki. I wonder if Miss Kitty knows when I read about other kitties and cry sometimes. How are you doing now? I appreciated your email and the moments of Suki's journey to her passing. I know she must have loved you so much. Have you had any more dreams and has she spoken again? I still have an email from you that spoke of how Suki enjoyed the sun and how it brought her back to life. I also remember how independent and grumbly she got when you had to go bring her back from running out the door. That really made me laugh. What a character. You said something like when she was walking up the stairs she turned around and looked at you and said, "I can do it myself!" I'm imagining and sending a very long hug and a beautiful warm white light for healing -- for you. My baby Boo Boo is gone. He woke up happy every day of his life and was treasured in a way that only those who feel the same devotion can understand. My darling is with Suki and the others who had time but no money, money but no time, unconditional love but incompetent care, attentive care but no hope. Never stop, Julie. Never give up, never be silent. For Suki.